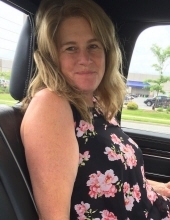 With our deepest sadness we announce the passing of Kelly at Trenton Memorial Hospital on Wednesday, April 10th 2019 in her 53rd year after a two year courageous battle with cancer. Cherished wife of Emile "Oats" Lajoie. Loved mother of Amanda, Jenna, Sarah and Melissa. Dear daughter of Barry & Lynne Hunter and daughter-in-law of Gloria Lajoie & Cosmo Ciocca. Lovingly remembered by her sister Wendy, brothers Steve (Shani), Lyndon (Tina), sister-in-law Lynne (Jim) and brother-in-law Dwayne. Ever remembered by her nieces and nephews Lauren, Ben, Ashton, Mack, Kyra, Myra, Corey, Lexie and Madison. Kelly passed surrounded by the deep love and caring of her husband, daughters and family. Kelly has taught us what true courage and strength are. She was a fighter and an inspiration to all who knew her. Kelly loved her family and was a dedicated loving Mom first. Her daughters were the pride and joy of her life and she embraced every moment with them. She could be found cheering at hockey arenas, rugby fields, volleyball games, soccer pitches or wrestling mats on most days. Kelly lived a wonderful life and was a friend to all whose lives she touched. She loved good food, get together's with friends, camping, painting nights, traveling and hiking trails with her dogs. Her personality was infectious. The legacy of Kelly’s spirit will live on. Thank you to all who supported her through her battle, words can not express our gratitude. To the doctors and nurses that cared for Kelly thank you for your kindness and compassion. Kelly will be dearly missed and forever in our hearts. We will carry her with us, till we see her again. "Email Address" would like to share the life celebration of Kelly Elizabeth Lajoie. Click on the "link" to go to share a favorite memory or leave a condolence message for the family.